Inbox Marketing is the specialized company in letterbox marketing that belongs to Hit Mail Group. 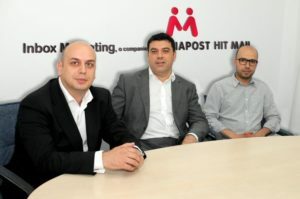 Hit Mail Group has a market share of around 25% of the Romanian market for direct marketing and registers a constant growth of over 50% yearly, for the last 5 years. Inbox Marketing is a full member ELMA (European Letterbox Marketing Association) since 11 May 2007, after being an associate member since 2005, www.elma-europe.com. Inbox Marketing has ongoing mailbox distribution projects in over 100 localities in Romania. For specific projects the coverage can be extended to all towns and part of the rural population. Inbox Marketing has local offices and storage spaces in Brasov, Cluj Napoca, Constanta, Galati, Iasi, Ploiesti, Timisoara and Braila.